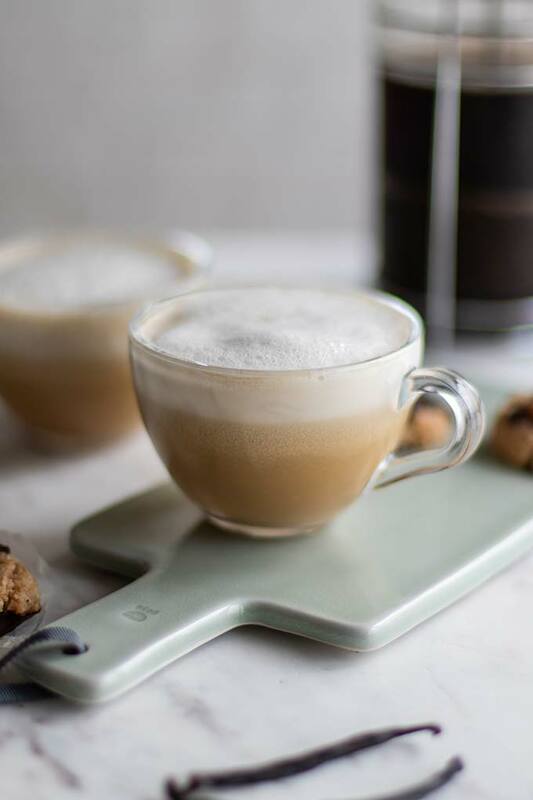 A clean eating coffee house remake – this healthy Almond Latte is made with homemade vanilla almond milk creamer, and is naturally sweetened with dates! This paleo and vegan latte can be enjoyed hot or over ice. I was so excited when I found out Starbucks was going to start carrying almond milk — and then so sorely disappointed to try it only to find it was way too sweet, and not very creamy. A store bought carton of almond milk doesn’t make a good latte. Almond milk is mostly water, so mixed with coffee, the almond flavor is totally overpowered by strong coffee. A good almond latte needs to be made with a thick homemade vanilla almond milk creamer. While it sounds complicated, it literally takes minutes to make (once your almonds are soaked!). 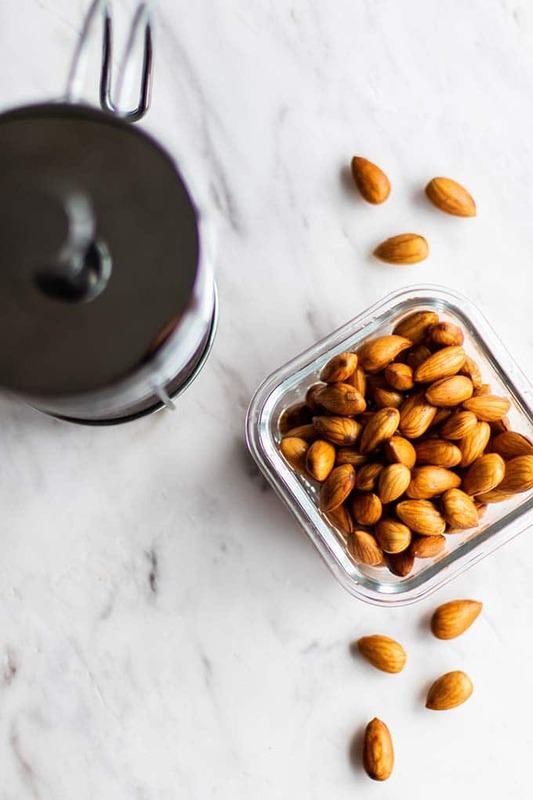 After you have plump soaked almonds (you might want to soak a few extra — these make a surprisingly delicious snack all on their own! ), add them to a blender with some water, a vanilla bean, and a date or two (or three). One large medjool date is enough to make a lightly sweet drink, 2 medjools makes it pretty sweet, and 3 will leave it as sweet as a coffee house flavored drink. After the mixture is well incorporated (it will take 2-3 minutes in a high speed blender, or longer in a standard blender), pour over a cheesecloth or into a nut milk bag to strain out the almond pulp. A little messy, but believe me, it’s worth it! Once you’ve tried this simple almond milk creamer, there’s no going back. Almond milk, while I love it, doesn’t really taste like almonds — this upholds the very essence of almonds in a luxuriously silky cream substitute. One you have your almond creamer made, you’re ready to make either a hot latte or an iced coffee. I like to start both drinks with cold brew coffee. You can also use espresso, or even instant coffee made extra strong. This vanilla almond milk creamer foams in the blender, with a whisk in a saucepan, or using my favorite technique- with a milk frother. Since you most likely already have your blender dirty, just let it run a few extra minutes, and you’ll have enough foam to make cappuccino like treats. Even if I am making them iced, I froth the almond creamer well so I have a frothy top to my drink. Dates are a great sweetener for drinks, especially when you’re already blending up nuts for a vegan or paleo option. If you love the idea of a healthier coffee or tea beverage, check out my Hazelnut Hot Cocoa, Hazelnut Iced Chai Latte, or my Caramel Mocha Iced Coffee Concentrate. 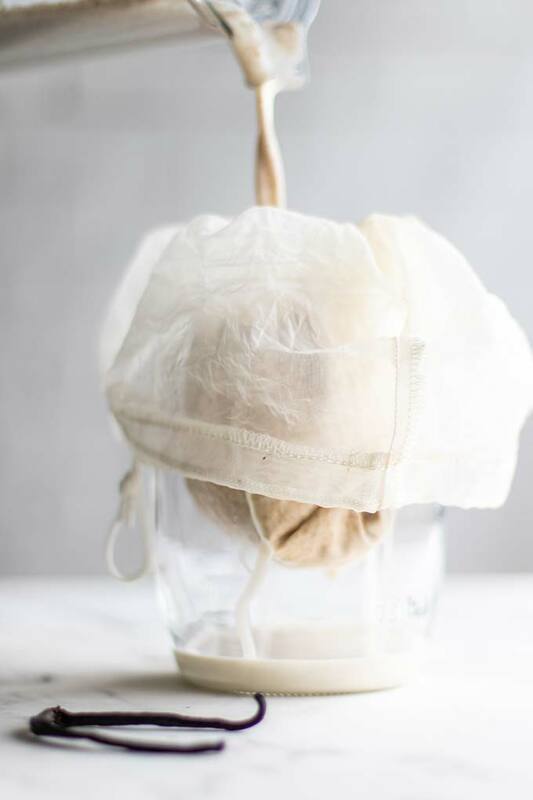 I use a nutmilk bag to make homemade almond milk. I’ve used coffee filters and cheesecloth also, but it’s so much faster and easier using the purpose made bag, it’s worth the small investment. I use my Vitamix to make nutmilks, but soaking nuts ahead of time makes them easy to blend in any blender. 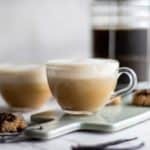 A homemade vanilla almond milk creamer makes a luxuriously creamy almond latte that's both vegan and paleo friendly. Serve these healthier lattes on ice or hot. 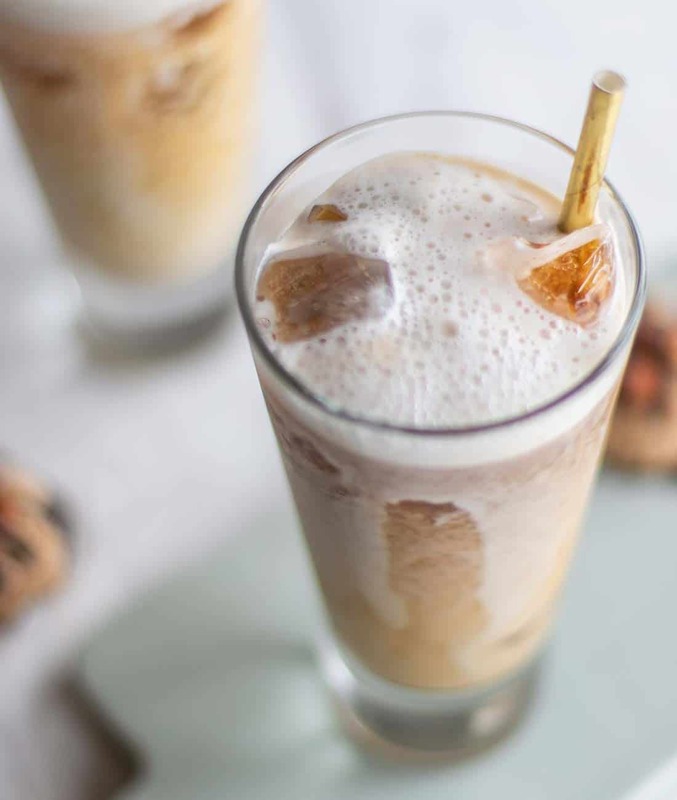 Plan on soaking the almonds overnight prior to making these drinks, and if you'd like, use Cold Brew Coffee, which also needs to be made the day ahead. 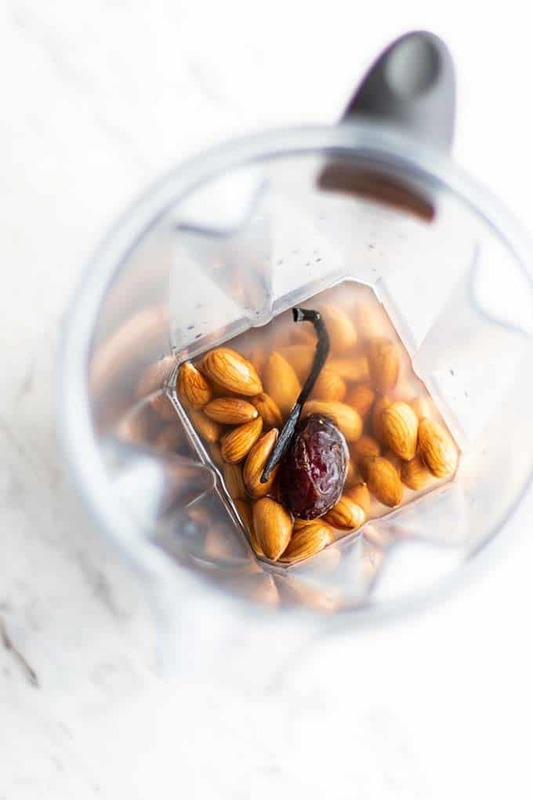 Add soaked and drained almonds to a blender with pitted dates and vanilla. Choose 1-3 dates depending on desired sweetness. Start by adding 1 1/2 cups of water, and blending into a fine puree, about 2-3 minutes in a high speed blender. Add 1/2 cup more water, and pulse to combine well. Strain almond pulp out of the cream by pouring into a jar with a nut milk bag or with cheesecloth. After the creamer has stopped dripping through, be sure to squeeze as much creamer out of the pulp first before discarding. Quite a bit of liquid will still in in the pulp. If making hot lattes, heat cold brew coffee or make espresso or strong French press coffee. I like these with slightly more than half being almond creamer. 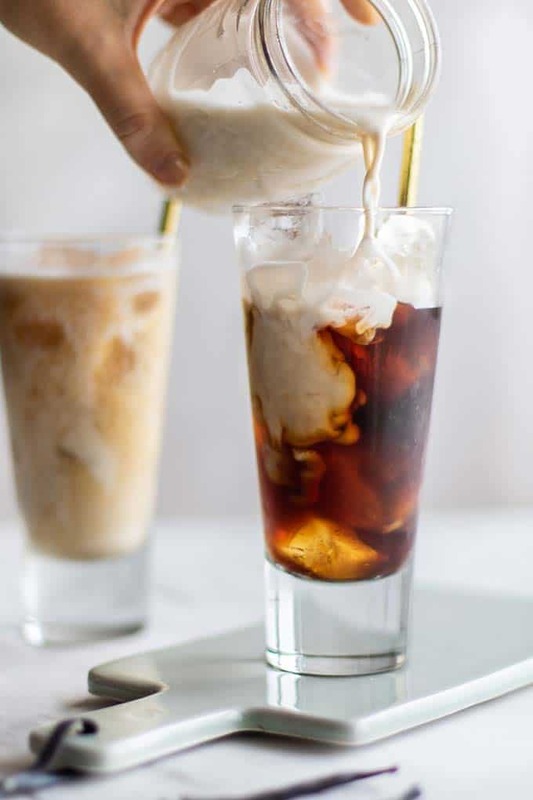 If making iced lattes, fill glassed with ice, and pour them about 1/2 way full with either cold brew coffee or espresso. Fill the rest of the glasses with vanilla almond milk creamer. *Smaller dates can be substituted for medjools. Use 3-4 small dates in place of 1 medjool. **French press coffee or strong instant coffee also works well in these lattes. O nothing beats homemade nut milk <3 SO fresh and this looks like a delicious latte for it! Thanks Rebecca -- I am having another one right now as I watch the snow fall :) We are supposed to get over a foot in the next 24 hours! I have missed winter. I was looking for a great non-dairy creamer and now it looks like I found one. I have not made homemade nut milk yet and now I will have to try. Great recipe! A healthy non-dairy creamer is hard to find! I prefer my own homemade nut milk creams, but if you want convenience (which I do from time to time! ), try Nutpods -- you can buy it on Amazon, and it's made from coconut milk and almond milk -- and unsweetened. Thank you so much for this recipe. I will definitely try this first thing tomorrow! You're so welcome Ashley! It makes such a difference to use homemade almond milk-- much thicker and uh.. "almondy" - the store bought almond milk is mostly water and I really don't like it in coffee. Thank you for checking out my blog and I’m so sorry about the error. I’ve been having some issues, but I will definitely let you know about the meal plan as soon as I work out the kinks. I understand Ashley! No worries -- just didn't want you to miss out on potential new subscribers :) It's hard being a one-man show, I know! That's a good question Kathryn! Do you not like dates? I am sure that using prunes would leave a very prune-y flavor and wouldn't have the same sweetness. You can definitely just add honey, or leave the sweetener out! Hi Kathryn! So good to hear from you again. My mom has made my date recipes with prunes for the same reason -- I don't really like the taste, but she thinks it's fine. You can now buy pitted dates at Costco - a giant bag for like $9 that will last a while! Do you have a Costco nearby? You can also buy them pitted at regular grocery stores but they get pretty expensive that way. I have never had my almond milk jellify, but it does go sour fast. I have read you can keep them around for 4 days, but in my experience, they only last 2 days. I have done research and experimented with things like sterilizing my storage containers (like you! ), but nothing seems to prevent it. If I figure out the secret, I will definitely write a post about it! 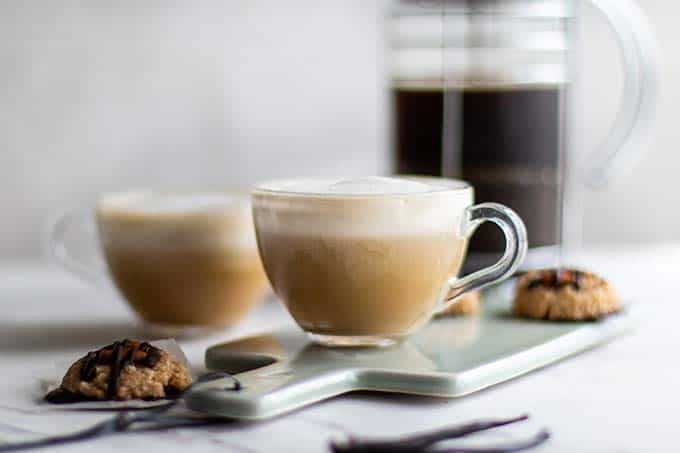 So glad to hear you're enjoying this latte recipe -- I am making it today for a special holiday breakfast with my family!